Posted on Fri, Mar 23, 2012 : 7:45 a.m.
Mavericks are, by definition, independent sorts. They’re not looking for a team. 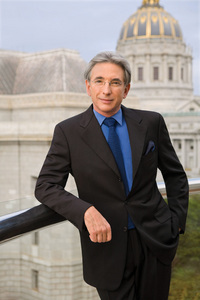 But when the choosing up starts, a musical maverick, an American musical maverick, perhaps especially a Bay Area American musical maverick, cannot do better than to have a guy like Michael Tilson Thomas as champion and chief. He’s the one you want on board, along, of course, with the San Francisco Symphony, the orchestra he leads, to make the case for your music. And make an engaging case, for mavericks past and present, is precisely what MTT and the forces on hand did Thursday evening at Hill Auditorium in the first of four American Mavericks concerts scheduled through Sunday under University Musical Society auspices. Indeed, most of the music on this first bill was approachable. The opening Copland “Orchestral Variations” was perhaps the craggiest of the works to summit. It’s austere, even in the huge orchestration (enlarged by MTT with Copland’s blessing), angular and built of granite. But its grandeur and even its fey moods and sweet sonorities came through in a clear-headed performance that just built and built to a tremendous climax. The first of the Bay Area mavericks, Henry Cowell, was up next, as was piano soloist Jeremy Denk, on hand to do the honors in Cowell’s 1928 Piano Concerto. It was a tour de force performance, both musically and physically riveting, as Denk used forearms as well as fingers to play the work, loaded with Cowell’s signature tone clusters. The piece was dazzling and engrossing: Denk managed to voice the clusters to realize the work’s musical lines. There was melody; there was color, sparkle and drive; there was also intricate repartee with the orchestra. As a friend remarked, if someone had told her a few months back that the audience would give the Cowell concerto a spontaneous standing ovation, she would have scoffed at the possibility. But it happened, with Denk as the engine driving it. Most of the orchestra could disappear after the concert’s first half: only piano and percussion were necessary as ensemble forces in the concluding Organ Concerto by Lou Harrison, and the first work post-intermission, Mason Bates’ “Mass Transmission,” didn’t feature any orchestra at all. It was the University of Michigan Chamber Choir and its conductor Jerry Blackstone who anchored the Bates piece. Bates was there as master of electronica (and master of ceremonies, introducing his piece); organist Paul Jacobs, also the soloist in the Harrison, manned the console. “Skyping in the 1920s” was how Bates described “Mass Transmission,” which evokes, through translated texts of wireless communications, the conversation of a mother and daughter separated by oceans and continents, the one in Holland, the other in Java. The texts are movingly set, with organ underpinning the voices and the electronica often serving as a static-y scrim for the communications. The center section is an idyllic Javanese sound-painting evoking the island. The choir sounded magnificent, as did the two soloists drawn from its ranks, Samantha Winter and Emily Goodwin. The intimacy of “Mass Transmission” gave way to the wonderful walls of sound that Harrison created in his organ concerto. Jacobs and the percussionists, many of whom played instruments of Harrison’s invention, gave a mesmerizing performance. It was a perfect close to a very entertaining evening, an evening as diverse in its musical motives as you’d expect a program devoted to mavericks would be. The San Francisco Symphony continues its "American Mavericks" programs in Ann Arbor with additional concerts tonight and Saturday, as well as a chamber-music performance by SFS musicians on Sunday afternoon. For more information, see the AnnArbor.com preview article or the University Musical Society website. Fri, Mar 23, 2012 : 2 p.m.
Fri, Mar 23, 2012 : 2:51 p.m.
Fri, Mar 23, 2012 : 1:01 p.m. Yes, yes, yes, yes. Go to umslobby.org for more audience feedback about the concert. There are more concerts by the SFO: Tonight, Saturday, Sunday.